Have you ever wondered why people are drawn to you? What makes you special? If there was a way for you to communicate that in two words, would you? I just finished reading the book How to Fascinate by Sally Hogshead and from that, I created what’s referred to as your “Anthem” aka YOUR unique tagline. You create this from the short assessment that you take (comes with the book). 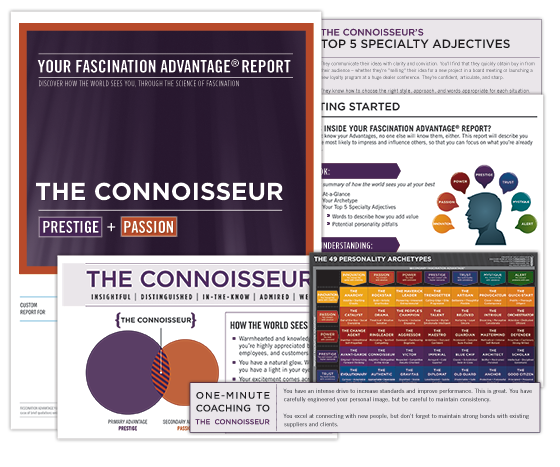 Once you receive your Fascination Advantage Report it will include your Archetype and the two Advantages (your most effective mode of communication) that create the Archetype. Does that sound like fun? From there you get ideas of words specific to your combo and you create your Anthem. And yes you can choose a different word too (I did). What this tagline can create is a quick introduction when you meet people of simply stating what you are about without a need to get into the story. Would creating your personal brand tagline be a contribution to you? A tagline that states the essence of you? To me it simplifies, this will serve as my elevator pitch and the first step in creating my personal brand. After all, we all have a brand whether we define it or not (how we walk, talk, dress, etc.) and why not create something that states the essence of who you are when you are at your best? I know for me I will now start asking “what will it take for me to step fully into/be “this”* today?” for one 🙂 l love taking assessments and what I love about this particular one is that in addition to all the tools and awarenesses I have already is that I now will use my tagline – *Energizing Explorations – moment by moment. After all, I can always change it if I become aware of something more expansive for me – woohoo! Click below if you are interested in reading the book and creating your own personal tagline (the Kindle version includes a code too – you just click on a button inside the book when it’s time to take the assessment). The book includes descriptions of all Archetypes. If you do take the assessment I’d love to hear what your Archetype and Anthem is. There is also a FREE abbreviated version of the assessment available on Sally Hogshead’s website that you can check out first if you wish. The book assessment is longer and more in-depth. CLICK HERE for the FREE version. Have you ever had professional photographs taken of yourself? Where the lighting is optimal, makeup & hair is included and worked with a photographer that you really click with? Would that be fun for you? While I love taking pictures of others myself I have been looking for someone to use for me. We all have different styles of shooting and natural light photography is what I favor. So recently I treated myself to a photo session with two spectacular photographers, Heidi & Tara with In Her Image Photography. While they are located in Northern California, they do travel around the US and also the world (I’m in Los Angeles).